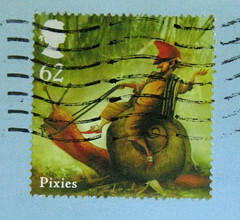 Another gem from Postcrossing, this is FR-268010 from France. It shows a photo by Jill Posener (in London, 1981), of an ad by Rest Assured Beds. 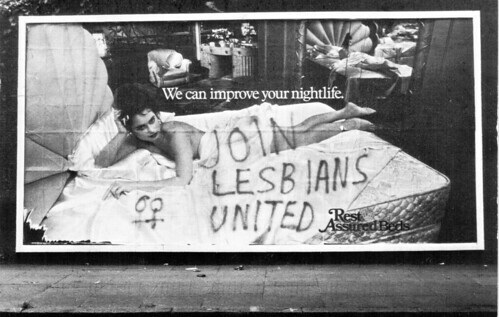 The ad tagline is "We can improve your nightlife," and it's been wittily defaced with "join lesbians united" graffiti. It's been a long time since I've come across a Jill Posener postcard, but I used to see them (and buy them!) all the time. She's a fantastic feminist photographer who happens to catch some great sexist advertisements that have been re-framed by wonderful feminist graffiti. This postcard was a treat to receive; it was published by The Women's Press in London. 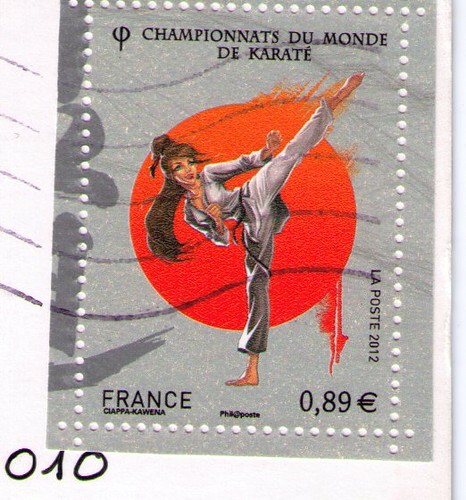 The sender also used a righteous stamp of a woman doing karate. Even though the woman looks a little anime/stylized (hello, unrealistically long legs), it's still a great image of a woman in a powerful pose, and a fantastically fitting accompaniment to this fabulous postcard. my provider allowed me to look at the website its very spammy and certainly not the official site of the photographer! Thank you SO much for letting me know! I updated my post to remove that information. I really appreciate it! Oh my goodness, that stamp! That'd be perfect for a karate kid (the original) themed envelope or something. Love, love, love this website. I already know I'm going to be addicted! Great way to photograph stamps by the way, I've been struggling with that!